As you may have figured out by now from reading my blog, I am a big fan of tacos/Mexican fare. Tacos are certainly one of my most favorite foods and I try not to limit myself to only one kind. I enjoy hard shell, soft shell, double decker and fillings of all kinds. While fish tacos may not scream Mexican, it does scream San Diego to me. I love fish tacos and always seek them out. In Naples, the choices are pretty limited. I find that some of the places that do offer them, only serve them with Fried White Fish. I prefer my fish tacos served with Grilled Mahi Mahi. While I have had some really bad fish tacos (Bokampers, Cheesecake Factory), I have found one restaurant that consistently serves up some great fish tacos. Miller’s Ale House is my go-to location for fish tacos. For only $8.95, you receive 3 fish tacos served up with Grilled Mahi Mahi, fresh Pico de Gallo, lettuce, shredded cheese and chipotle-cilantro sauce. Plus, you get a huge side of rice and beans. All for $8.95! Schwing! I prefer to order these tacos while dining at Ale House but, last week, we decided to get take out. I took a chance and ordered them for take-out and while they were good, they were not quite as fantastic as they are when you eat them there. I’m sure this can be contributed to the fact that they sit in a container for the 10 minutes it takes to get back home before consumption begins. Even so, they were quite yummy. While eating these tacos, I apply sour cream and cocktail sauce to each taco. Not a ton of either but enough to taste and appreciate the flavor. I also mix together the heaping serving of rice and beans and sometimes will dip my fork into the sour cream or cocktail sauce prior to scooping up some rice and beans. Okay, enough on my weird eating tendencies, let’s get to the food. The taco shells are basic flour tortillas that are warmed up. They have a crisp exterior and a chewy interior – a good flour tortilla. Grilled Mahi Mahi is one of my most favorite types of fish to eat and Ale House does a great job on theirs. 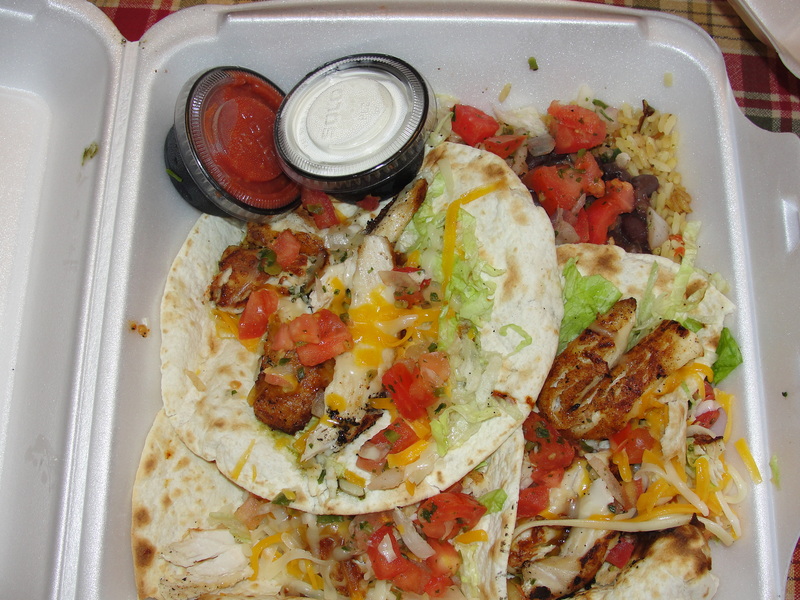 Each taco includes around 3 good sized pieces of mahi mahi. The mahi mahi has a nice chargrilled exterior and is perfectly cooked. The fish is moist and not dried out at all. The mahi mahi has such a great flavor on its own, that it really does not need any additional seasonings. In addition to the tortilla and mahi mahi, these tacos include the variety of toppings I mentioned above. The pico de gallo is fresh and very good. I enjoy the flavor the pico puts out from the simple & fresh ingredients. The lettuce and cheese are also fresh and tasty. On each taco, I always seem to receive a different amount of the chipotle-cilantro sauce. Sometimes it’s just enough and other times, they put way too much. On this batch of tacos, I received a decent amount. The flavor of this sauce is a good mix between chipotle and cilantro – it is neither too spicy or flavorless. 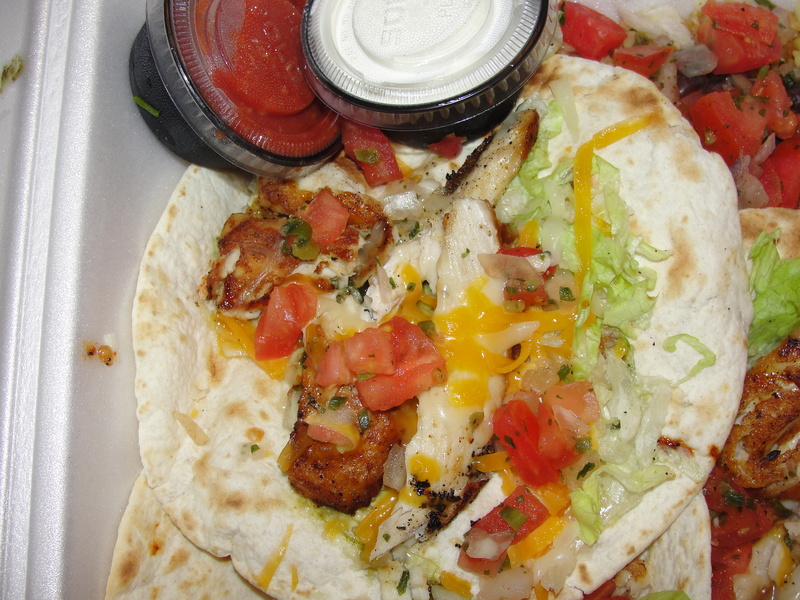 The sauce is usually right on top of the mahi mahi or on the tortilla itself. All of the fillings in the fish tacos really come together as one. I think this is what makes these fish tacos so great. While the mahi mahi is warm, the toppings are cool and the sour cream/cocktail sauce are cold. I really love how the 3 temperatures come together with each bite. Beyond the fact that Ale House serves up great mahi mahi, they also serve up great toppings for the taco. Add in that bit of sour cream and cocktail sauce and Bam! you have some great fish tacos. I love to pair these with the rice and beans served by Ale House. You always receive a large scoop of rice and beans…more than enough to go with each taco. For the rice and beans, Ale House used wild rice. The rice is not ‘sticky’ and is flavored with salt, pepper and cilantro. The beans are black beans and are pretty large. The black beans don’t have a ton of flavor on their own but mixed with the rice, and the tomatoes they add on top, they taste quite lovely. Even though these are not your traditional rice and beans, I do really enjoy them quite a bit. Pair these with the fish tacos and I am set. Even though Naples is on the Gulf of Mexico, it is extremely hard to find good fish tacos. Don’t ask me why…it makes no sense. I am very glad that I have the fish tacos at Ale House as a good, go to option. Perfectly grilled fish, fresh toppings and the side of rice and beans, make these fish tacos a real winner. Quality fish tacos, at a quality price…what could be better? Perhaps if rather than 3 tacos, you received 6 tacos for the same price. Yeah…that’s it.